-US economic surprise index falls to zero, is neutral for USD. -USD positioning highly correlated with economic surprise index. -USD "longs", at their largest since January 2017, are now at risk. The Dollar weakened Tuesday as risk assets outperformed safe-havens and, according to strategists at Westpac, is vulnerable to further losses in the weeks ahead now momentum behind the economy appears to be waning. 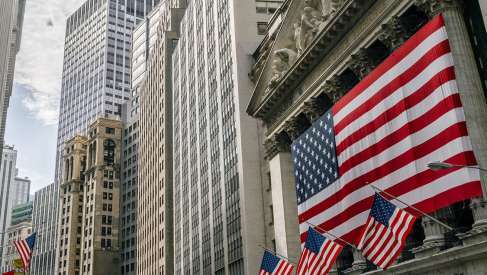 US growth picked up sharply in the second quarter, with GDP rising at an annualised pace of 4.1%, its fastest quarterly pace for more than four years. That, and a catalogue of other strong data, led markets to conclude the Federal Reserve would be able to go on raising its interest rate at a time when the outlook for interest rates outside of the US was seen deteriorating. This incentivised traders into selling other developed world currencies and buying the US Dollar, driving an about-turn that saw the Dollar index convert a 4% 2018 loss into a 3.1% gain during the four months since early April. But now, the tables are turning once again and strategists are flagging that this could eventually mean another reversal for the US Dollar. Analysts are increasingly divided over the outlook for the US Dollar. Above: US Dollar performance against basket of currencies in 2018. "There has been a reasonably decent positive relationship between the cycle in US data surprises and positioning in the USD. With the US data no longer pointing to exceptional outperformance on the activity front and positioning aggressively long, the USD may be vulnerable," says Richard Franulovich, head of currency strategy at Westpac. Westpac's US economic data surprise index fell below its six month average this month, after a weaker-than-expected series of PMI numbers for July and a nonfarm payrolls number that missed market forecasts by a country mile. Both IHS Markit and Institute for Supply Management indices of activity in JUS manufacturing and services disappointed for July. Above: US economic surprises with US Dollar positioning overlay. Source: Westpac. Chicago Futures Trading Commission data shows financial traders had bet $26.8 bn on a rise in the US Dollar during the week ending July 27. This was the largest bet on the greenback in either direction since January 2017 and was equal to 83% of the three-year maximum wager on the currency. That position fell slightly, to $25.3 bn, during the week to July 31 although this is still equal to 81% of the three year maximum. Financial traders were "long" the US Dollar and "short" everything else in the G10 sphere during both weeks. This marks a complete reversal of the situation that existed just four months ago, when traders were betting heavily against the US currency after it fell by more than 10% during the year to January 2018. Now, the Westpac team are midful that this bearishness could easily renew during the weeks or months ahead if US economic momentum slips further. But for now, their model continues to highlight the Dollar as a buy, along with the Pound and Canadian Dollar. 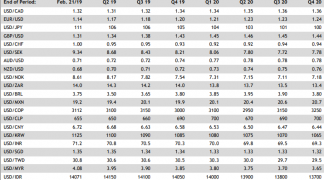 "The relatively stronger growth and yield qualities of the US, Canada and the UK continue to compel the model to hold outsized long positions in the USD, CAD and GBP," says Franulovich. "The model’s caution on EUR continues to grow." The Westpac G10 FX model uses a "multi-factor approach to systematically trading the G10 currencies" using a combination of macroeconomic forecasts and trading signals. Above: US and Eurozone economic surprise indices. Source: BNY Mellon. "Global data is stabilizing, after being strong last year and weak early this year. US data is very strong, but the market expectations have adjusted and data surprises are close to zero," says Athanasios Vamvakidis, an FX strategist at Bank of America Merrill Lynch. "We have been more optimistic than the consensus on the US economy and we remain so." The recent fall in US economic surprises is in line with what consensus forecasts would have observers believe is in store for the economy over coming months. Increasing numbers of economists are forecasting and economic slowdown in 2019, while some have warned of a possible recession once into 2020. Bank of America economists forecast US growth will continue apace this year and next before finally beginning to slow once into 2020, as the boost from President Donald Trump's tax cuts wanes and higher interest rates at the Federal Reserve begin to take their toll on the economy. The FX strategy team remain bullish in their outlook for the Dollar too. They forecast the Pound-to-Dollar rate will fall to 1.27 before the end of September and rise only to 1.31 in time for year-end, while the Euro-to-Dollar rate is seen declining to 1.12 by the end of September before recovering only to 1.14 by year-end. The Pound-to-Dollar rate was quoted 0.12% higher at 1.2958 Tuesday but is down 4% in 2018 while the Euro-to-Dollar rate was 0.31% higher at 1.1593 but is down 3.3% for the year-to-date. The US Dollar index was 0.32% lower at 95.05 but is up 3.1% this year.